Grilled chicken Caesar with bacon-herb-parmesan "croutons"
This was really quite good. Started with sauteing the tomatoes and garlic in olive oil, then once broken down, added lemon seasoned shrimp and herbs and vermouth. Turned heat off. Dressed pasta. Yummy. Skipped the scallions. Added 1 fennel bulb chopped to sausage saute. Added butter, parmesan and ricotta mixture to hot pasta and then broccoli and sausage mixture. This was pretty good, but lemoney. Unusual. Very Good! Easy, quick. Substituted halibut and heriloom cherry tomatoes. Pretty. Best if finished in the oven. Added some parmesan and fresh bread crumbs to the flour for interest and texture. Served with steamed asparagus & bread. For more than a decade, Rachael Ray has wowed you with her flavorful dishes on TV. And she has written one incredible collection after collection of delicious 30-minute meals. Her latest cookbook includes her most-requested recipes from fans like you and her family faves. 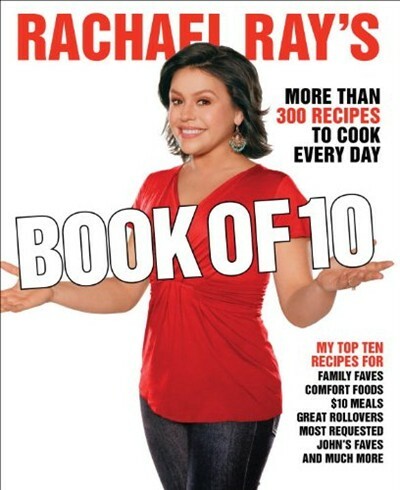 Rachael Ray’s Book of 10 is jam-packed with thirty top 10 lists of recipes in all your favorite categories. Leave it to Rachael to make a book that is easy to use and fun, too! There’s a chapter on Burgers with 10 Figure-Friendly Faves, 10 of John’s Faves, and 10 Gut-Busters. She has lists of Date Night/Fake Outs for you and your special someone, Seafood for a Steal, and Potluck Picks. You will find a list of 10 for whatever you are making for dinner—Family Faves, Great Rollovers, Kids’ Picks, and many more. There are even 10 variations on Surf ‘n’ Turf! Looking to show off? Try Spinach-Stuffed Steaks with Sautéed Cremini Mushrooms. How about a veggie sammie? Rachael includes Grilled Eggplant Roll-Ups and Mushroom Veggie Sloppy Sandwiches. What’s great for the grill? Baby Lamb Chops with Artichoke and Tarragon Dip or try a Grilled Flank Steak Sandwich with Blue Cheese Vinaigrette–Dressed Arugula and Pears. Rachael has a recipe for you for every simple dinner, family meal, and special occasion. There are endless ideas here for what to put on the table.